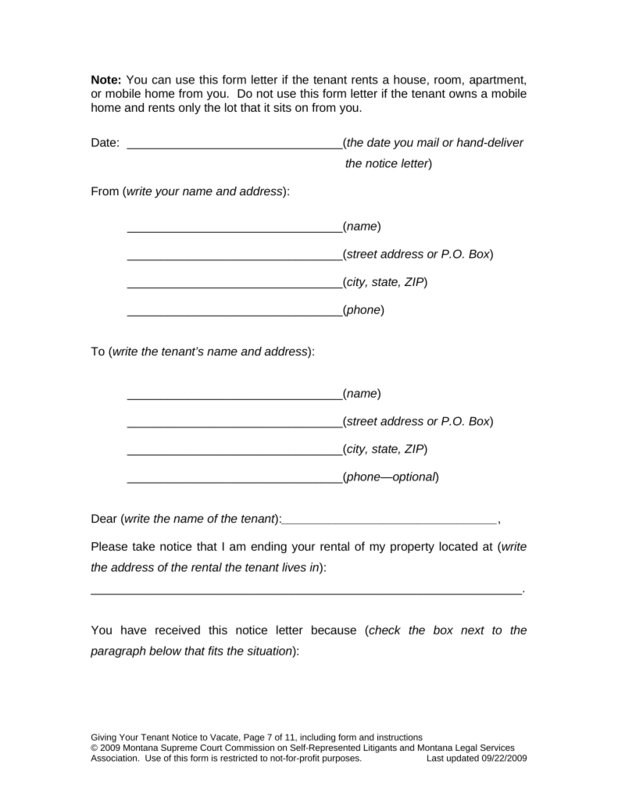 The Montana eviction notice form can be used in all situations where landlord can legally evict a tenant in Montana. Note the notice requirements for each situation and make sure you provide notice and wait the requisite time period before filing a complaint. In Montana, you can file an Action for Possession in City Court, Municipal Court, Justice Court, or District Court. You will need to file a Complaint and Summons and Request to have the forms served on the tenant. The tenant will have ten (10) days to respond. The landlord will need to Request a Hearing from the court if tenant files an Answer, otherwise landlord will be issued a Judgment. If the tenant fails to vacate, landlord can apply for a Writ of Assistance to have the sheriff move the tenant out of the premises. Guide – Instructions provided by the State on how to evict a tenant. Rent is due on the date set forth in the lease between landlord and tenant. If rent is late, landlord must provide three days notice before commencing eviction proceedings. Step 1 – The first thing a landlord must do is provide requisite notice to the tenant of the violation and the intent to seek redress in court if tenant fails to make the changes required, the payments required or fails to move out as directed. 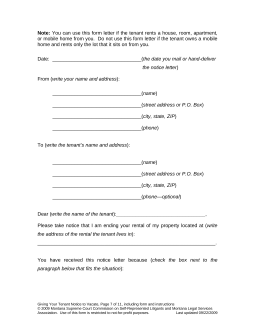 A landlord can use this form to notify tenant making sure that he or she provides the correct time period for tenant to respond upon receiving notice. Step 2 – If tenant fails to respond, landlord may file a Complaint and Summons in the City Court, Municipal Court, Justice Court, or District Court. In addition, landlord will have to file a Request to Serve in order to have the sheriff properly serve the tenant with the Complaint and Summons. 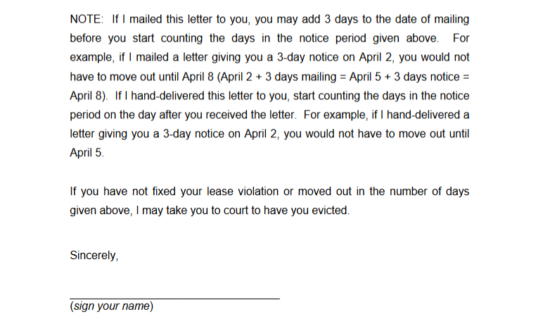 Step 3 – Tenant will have ten (10) days to Answer after receiving the complaint (View Guide to Answer an Eviction). If tenant doesn’t answer, landlord may receive a Judgment from the court. If tenant does answer, the court will set a hearing within 20 days after the landlord files a Request. Step 4 – If the landlord prevails, but the tenant still fails to move out, he or she may apply for a Writ of Assistance to get the sheriff to move the tenant out. On the first line of this document, report the Date this Notice is mailed or personally served to the Recipient. Provide the Name, Address, and Phone Number of the Landlord issuing this Notice. Locate the word “From.” On the first blank line under this word, report the Full Name of the Landlord. On the second blank line, report the Street Address (Building Number/Street, Apt. Number) or P.O. Box the Landlord uses to receive Mail. On the third blank line, enter the City, State, and Zip Code for the Landlord Street Address just reported. Finally, on the fourth blank line, report the Landlord’s Phone Number. While it is not required to report the Landlord’s Phone Number, it is recommended as a convenient line of communication. You will need to document the recipient Tenant’s information in the next section (under the heading “To”). Locate the blank line following the word “Dear.” Enter the Full Name of the Recipient Tenant on this line. Locate the blank line in the first paragraph after the Notice Introduction. Enter the Address of the Leased Property the Landlord is providing a Notice about. Make sure this is a full definition including the Building Number, Street Name, City, State, and Zip Code of the Leased Property exactly as it is reported in the Lease. The next section will contain several Notice types beginning with four basic Notices. You may only select the Notice that applies. If more than one Notice applies, it is recommended to fill out a form for each Notice. Locate the type of Notice you wish to send then mark the corresponding check box. If the statement you selected requires information, make sure to enter it. Mark the first check box, if you are ending a Month-To-Month Tenancy and require the Tenant to move out of the Leased Property Thirty Days after receiving this Notice. Mark the second box, if you are ending a Week To Week Tenancy and require the Tenant to move out of the Leased Property Seven Days after receiving this Notice. Mark the third check box, if you are informing the Tenant they must pay his or her Over Due rent in Three Days or vacate the Property. Make sure to enter the owed Rent Amount, on the blank line labeled “Rent,” in this selection. Mark the fourth box, if the Tenant is guilty of violating the Lease Agreement the same way a second time in six months and you require the Tenant to move out of the Leased Property Five Days after receiving this Notice. Use the space provided to describe this violation. Note: This may be checked if the Tenant has received a Notice regarding this violation within the past six months. Locate the statement beginning with the phrase “You must move out within 5-Days…” This section will contain Five Day Notices. 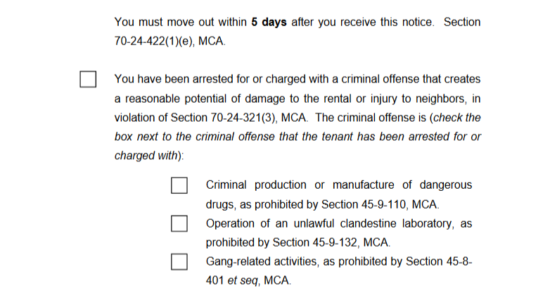 If you require the Tenant to move out within Five Days after receiving this Notice because they have been arrested/charged with a Criminal Offense that represents a danger to the Property or other residences, mark the first box in the “Five Day Notices” area. This check box will contain three ‘sub-check boxes’ which serve to define the laws the Tenant broke. Select one of these boxes to further define the Tenant’s Criminal Behavior. Locate the term, “You must move out within 3 days…” This section will have Notice Statements requiring the Tenant to move out for the Violation you select. If the Tenant must move out because he or she has an unauthorized pet or guest living on the Leased Property, mark the first check box in this area. If the Tenant must move out because his or her decisions or actions have caused damage to or destruction of the Leased Property, select the second check box. If the Tenant must allow Access within Twenty-Four Hours of this Notice or move out within 14 Day as a result of denying the Landlord access, then locate the selection beginning with the words “You refused to give me lawful access…” and mark the corresponding check box. If the Tenant has altered, removed, or replaced a Lock on the premises and must correct the situation locate the box preceding the words “You have…” and place a mark in it. Then check the first box if the Tenant must re-install a Lock he or she removed within Fourteen Days of this Notice or check the second box if the Tenant must furnish the Landlord with a key for a new lock within Fourteen Days of this Notice. If the Tenant has abandoned the Property and must be informed that his or her Lease has been terminated, then select the check box for the statement “You abandoned the rental property…” Enter the Address of the Rental Property being referred to on the first blank space of this selection. Then on the second blank space, in this paragraph, enter the Date the Property has been re-rented. If the Tenant must be informed the Rental Property shall be considered abandoned, then select the sentence beginning with “You abandoned the rental property,” then enter the Date you believed the Tenant abandoned the Property on the blank line in this statement. If the Tenant has been noncompliant in some way with the Lease Terms that has not been mentioned, then locate the check box preceding the statement “You have committed some other non-compliance…” Place a mark in this check box then fully describe the violation in the space provided. The two paragraphs shall contain information regarding the Delivery of this Notice and the intent of the Landlord. Read these paragraphs carefully. Then below the word “Sincerely,” Sign your Name. Note: You must be the Owner, Landlord, or Landlord Agent of the Property to issue and Sign this Notice.